I had a bit of a groan-inducing moment this week but, the up-side is that it’s given me a good topic to write about. Turns out the pickguard screws were corroded and dirty. That might not sound like much of a problem but it really can be. 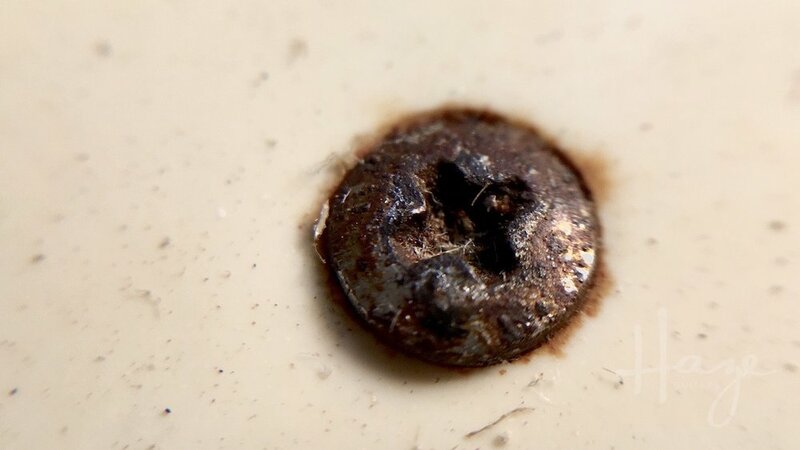 First off, when the slots in the screw head get full of rusty/oxidised crud, probably mixed with a myriad of other mystery-gunk, it becomes hard to actually get a screwdriver in. If the screwdriver doesn’t insert deeply enough, rather than snuggly gripping, it will, at best, do nothing, and at worst, start to grind and wear off the corners of the slot. Screws rust, corrode, and get caked with crud. It can be difficult to deal with this. Combine this wearing action with a screw that’s already somewhat corroded and rusty and you’ve got a recipe for disaster. If things go far enough without any action, you can end up with a screw head that’s got a rounded crater instead of a nice sharp slot. Screwdrivers don’t grip well in rounded craters. As a slight aside, this sort of wear is worsened when people use a screwdriver that's not the right size for the screw-head. You need a snug fit to prevent any slippage and inadvertent slot-wear. First step is to remove the gunk and crud from the screw slots. In many cases, this is enough to clear a path for the screwdriver to grip and all is well. Depending on the instrument and it’s ‘vintage’ value, you’ll probably replace the screws before they get any worse. A dental probe is the ideal tool for this job. You can carefully poke and scrape into the screw slots and you’ll be surprised how much stuff comes out. Actually, dental probes are great for a lot of similar crud-scraping jobs. If your guitars tend to get a bit grimy (or if you work on guitars that do), I really recommend you get one. It can be invaluable for this sort of thing. You’ll get them easily on eBay and on Amazon (US | UK) (affiliate links). So. Clean the slots and all may be well. Referring back to that rounded crater image above, that’s beyond any dental probe help. If you’re really, really lucky, they screw head will be high enough to grip (carefully and protecting the guitar) with a pliers. If so, yay! Using a cutting disc in a Dremel-style tool, it’s possible to cut a new slot in the top of the screw. Now, I’ve italicised ‘possible’ for good reason. This is not without risk. It would be easy for that cutting disc to slip and to mar the guitar. If you’re going to do this, make sure to protect the area around the screw as much as possible. Keep a really close eye on things (wearing goggles, of course) as you go. Because the disc is circular, it will cut a little deeper in the middle of the screw-head than at the sides. That’s great. It’s the sides you’re most concerned about. You want to stop before that disc cuts into the surrounding guitar top, pickguard, or whatever. It ain’t pretty but this newly cut slot was enough to get this screw out. The end result will often be very far from pretty (like this ugly thing), but it’ll hopefully give you a slot that’s enough for a flat-head screwdriver to grip. Choose a screwdriver that fits as snuggly as possible to try prevent any wear of your new slot. Messy and risky, I know. I don’t blame you if you want to try the screw-extractor bit route first. Just remember that the more worn the screw head gets, the more risk of all of this extraction advice failing. Older PostCheap alternative to guitar nut files?